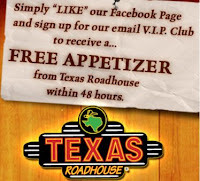 Go "Like" the Texas Roadhouse page on Facebook & sign up for their VIP Club to get a free appetizer within 48 hours. Click the link below to go to their Facebook page. Just click the link below to go to the Texas Roadhouse Facebook page.